Located in Lincolnshire North of Lincoln and just East of Scampton village, alongside the A15. 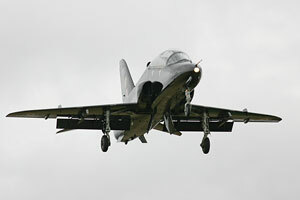 Only around 20 minutes drive from RAF Waddington and 40 mins from RAF Cranwell. Famous as the home of 617 Squadron - The Dambusters - during WWII, Scampton became a v-bomber base and was massively expanded as a result, causing the A15 to be diverted in a big curve around the north-eastern end of the runway. It is now home to the Royal Air Force Aerobatic Team, The Red Arrows, and Hawker Hunter Aviation have a small enclave on the station too. Hawks! Red ones. And perhaps a Hunter or two if you're really lucky. 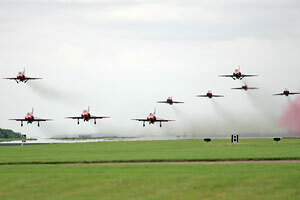 Aircraft from other nearby RAF stations make occasional approaches but generally this is a quiet station where most of the flying is the Reds practicing their routine in the work-up prior to the airshow season and then keeping their hand in during the season. 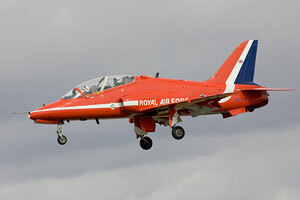 Flying here is almost always office hours on weekdays, but during the airshow season you will see occasional launches or recoveries from the Reds as they depart to or come back from airshows elsewhere. Approaching from the A15 (Lincoln direction), you'll go past the main gate on your left, followed by a layby, and just as the road begins to curve to the right you'll see a small road off to the left. Take this road (the old A15) and it will take you up past the station fence, past the firing range and on your left there will be car park (point A). This is the 'viewing area', but is fairly useless as it's surrounded by high fences. It does however offer the only place up here to park your car, as the remainder of the lane has double yellow lines everywhere. Park your car here and you can walk up to crash gate 8 (point B) which is quite close to the taxiway but again it's all high fence territory so a large ladder would be handy. Don't lean the ladder against the fence or the crash gate, and be prepared for a visit from base security anyway, as the security personnel at Scampton are bizarrely touchy (compare with the far more laid back attitude at the RAF's premier front line fighter station at Coningsby just 40 mins or so away!). Assuming you fancy clearer views of aircraft taxiing or coming in on approach to runway 23, it's time a for a walk. 15 mins or so plodding along the fence line to the north east will bring you to point C (be prepared to dive through a tree at the final corner of the fence, it's possible to squeeze through - just! ), where the high fence turns into a short wooden one which you can see over without any need for a ladder or steps. From here you can shoot through/over the high fence directly down the taxiway for head-on shots. You can also walk up and down the wooden fence line to vary your distance from final approach - avoiding the centreline, naturally - and get landing shots with ease. The runway itself is invisible from by the high fence, but as you walk closer to the approach the land rises up so you can see the runway. Unfortunately there have been reports of the farmer objecting to people accessing this viewing point, therefore if you can find anybody working in the field here it's best to be pro-active and ask permission to stay here. There is an option for approach photography at this end that means far less walking; so back to the car, return to the A15 and turn left. Shortly after it curves left you'll come to a crossroads, take the left into this small road and you should see the approach light poles straight away. There is a small farm track on your left (point D) and there is room for a car or two to park at the start of the track while leaving it clear. This is further back from the runway than point C, and trees mask your view of the approach, but you can stand on the edge of the road to get a clearer view. There is a field of crops between you and the station fence so don't go tramping across from here. The tenant of the house at the end of this track is - as of 2016 - NOT happy with people viewing from the track area, so given recent incidents of people being stood directly under the final approach path and bringing the day's flying to a halt, it is best you avoid this end of the airfield. Back into your car and continue along this narrow road (and note there are parking restrictions precluding any use of the verge) and you will come to a crossroads with a bungalow on your right and a small dead-end on your left. This is a crash gate access lane and while there is room to park several cars on the left side of the lane, station security sometimes move people on and the resident of the bungalow would also prefer people did not park around here. This is a shame because from here it's just a short walk along the fence to get to the end of the runway and the area around point C once more. The view from the crash gate itself is not great due to distance from the runway end and the high fence, and the taxiway on this side is rarely used (probably only by HHA's aircraft). Given the resident's wishes this is probably an area best avoided once more. Continuing along the road, as it curves right there is another bit of verge where people often park to watch the flying; again the view is through a high fence and you may be moved on. Certainly not a place to leave your car and go walking. Continue further then, and you'll come to a sharp right turn with a small lane on your left. 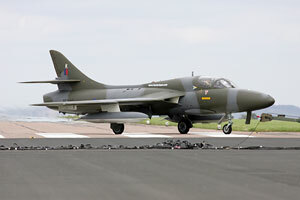 This leads to the gate to Hawker Hunter Aviation (point G). You can see their hangars from here and, rarely, you may see some of their aircraft parked outside. The view is again through a high fence though. Our next spot is some distance away so back in the car and continue up the road, taking the left turn for Brattleby, and then left onto the road towards Scampton village. You'll pass through Aisthorpe and just outside the village on the left there is a track running up the hill. This is not suitable for all types of car - if you have a low bumper, forget it, as the grass centre to the track will no doubt prove too high. The track curves up the hill and becomes rougher as you go but is generally driveable with care and leads to an area by the fence with a pile of rubble and a section of wall (point H). This offers an elevated view over the fence, but is a long way back from the runway and the rarely-used taxiway is obscured too. It is however a great spot to watch any displays from. For a different angle on proceedings you can proceed further down the track to the south; there are a few gaps in the foliage to enable views of the taxiway but given its lack of use and the sun being in your face for much of the day don't expect many opportunities! Back down the lane towards the main road and turn left to go into Scampton village. On your right just before the road curves left is the church of St. John the Baptist (point I). In the graveyard north of the church there are a lot of WWII RAF graves - well worth a visit. In the smaller yard to the east of the church there are also some WWII Luftwaffe graves, those of a bomber crew that crashed nearby. 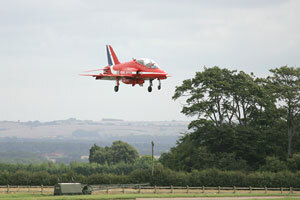 Back to the car and continue round the left-hand bend through Scampton village. You'll come to a right-hand bend with a small lane off to the left - don't bother investigating down there, it's well below the level of the airfield with no view whatsoever. Continue down the road and you'll go past a small layby and the airfield fence. You could park here and walk along the fence to final approach, but there is another option - continue until you see the approach lights on your left and there is a small farm track running through the lights and up to the fence. There is enough room by the side of the track against the high fence to park several cars (point J), and the farmer doesn't seem to mind (nor do station security judging by my last visit - as long as you keep well clear of the crash gate at the corner of the fence). From here you have a view through the fence towards Foxtrot Dispersal and can walk along the fence line to the smaller wooden fence along the runway end (point K). From here you have a distant view of the pans in front of the main hangars, no good for photos due to distance, but a great view of any flying. 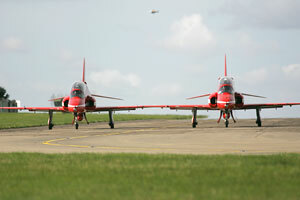 Take-offs on runway 23 come towards you can the Reds usually stay pretty low; Hunters always stay low! For landings on 23, the Hawks will rarely if ever come all the way down to the end, but the Hunters do so you can get a head-on taxi shot from here (though a long lens is needed - 500mm territory really). Landings on 05 are of course easy to view. It's also a pretty good spot to watch displays from, though it's more head-on stuff than the topside stuff you get over at point H.
A final spot worthy of a look at Scampton is within what used to be the station housing on the South-East boundary of the airfield. Continue along the A1500 to the East and turn left on the roundabout onto the A15. Then take the first turn-off on the left into Scampton Way (this is well prior to the station entrance, so if you get to the main gate, you've gone too far). Follow Scampton Way to the T junction and turn left into Pollyplatt Lane. The lane ends at a crash gate - do not obstruct this, you can find parking by turning left here and following the road round to the right - there's a large parking area by the fence (point L). The fence makes photos tricky needless to say but the aircraft do taxi past only a short distance away. The overall attitude of the station is as mentioned previously a bit touchy - with several reports of people being moved on from areas that would cause no fuss at all at far more active stations with a frontline role. Accordingly be on your best behaviour and be prepared to move along and come back another day. 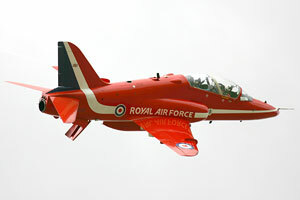 There is a station museum, and the Red Arrows do host station visits from time to time - contact details above. Contributors: author, Fighter Control forum.